Xiaomi is one of the best Android OEMs out there. Their hold in China is well known, but they are equally well-performing in another large market for smartphone, India, where the most sold device is theirs only, the Redmi Note 4. As a result, Xiaomi is now releasing its new handsets sooner than ever in India. But can they match the solid hardware they offer on their devices with an equally swift rollout of Oreo update, the latest Android OS right now? Let’s find out. On January 12, 2018, Xiaomi released its first Oreo update, albeit as a beta! It’s the Mi 6 smartphone that received the Android 8.0, but the stable version is not yet out. Once Mi 6 Oreo begins rolling out for the public, we can expect more devices like Redmi 5 and Redmi 5 Plus, etc. to join in pretty soon. Xiaomi has an impressive list of hardware, with nice value for money handsets being offered from budget-range to mid-range. But their software updates are not that cool. Sure, they can release their proprietary UI, the MIUI, for larger no of devices, but the said MIUI version is not guaranteed to bring the same Android OS version for all devices. For example, their latest version, MIUI 9, is based on Android 7.1.2 for some devices (Xiaomi Redmi Note 5, Note 5 Pro, Xiaomi Mi Note 3, Xiaomi Mi 5c), Android 7.1 for some (Xiaomi Mi Max 2, Xiaomi Mi 6 and Xiaomi Redmi 5), Android 7.0 on many, while even Android 6.0/5.0/4.4 on some. So, just because they are providing MIUI 9 or MIUI 10 on your device doesn’t mean you are receiving Oreo update. It really depends on which Android version the given MIUI software version packs for your device. For older devices like Redmi 2, the MIUI 9 is available at the moment, but it gets you only Android 4.4 — to be fair though, you get many, many features that aren’t or weren’t available on Android 4.4, and thus they deserve credit to support old devices with latest version MIUI, even though it is based on Android OS released way back in 2013. So, with that in mind, let’s check out which Xiaomi devices will get Android 8.0 Oreo update. The above is a list of Xiaomi devices that should be receiving Android 8.0 Oreo update. If your device is not mentioned in the list above, then probably it’s not gonna receive Oreo OTA from Xiaomi. It might receive MIUI 9 as an update, but it may be based on Nougat (Android 7.0/7.1.1) and not Oreo. Update [January 12, 2018]: Xiaomi has released its first Oreo update, albeit as a beta! It’s the Mi 6 smartphone that is receiving the Android 8.0, and if the testing goes smoothly, we could see the stable rollout of Oreo from Xiaomi sometime next month. The Mi Mix 2 is company’s latest flagship device, one that runs on Android 7.1.1 at the moment. The Android 8.0 update is only natural next big release for the device, and it should be rolling out for the Mi Mi2 when Xiaomi has one ready. The Mi Mix 2 could see its Oreo OTA become available along with Xiaomi Mi 6, as these two are expected to be the first two devices from Xiaomi to get Oreo as an OTA, even though we could already see Mi 7 come pre-installed with Oreo. Launched with Marshmallow, the Mi MIX has already received Android Nougat, the first major OS upgrade. Being a flagship phone, Xiaomi is giving it what it deserves – Android Oreo update. While this OS isn’t yet out, testing is ongoing, with an expected release date of Q2 2018. 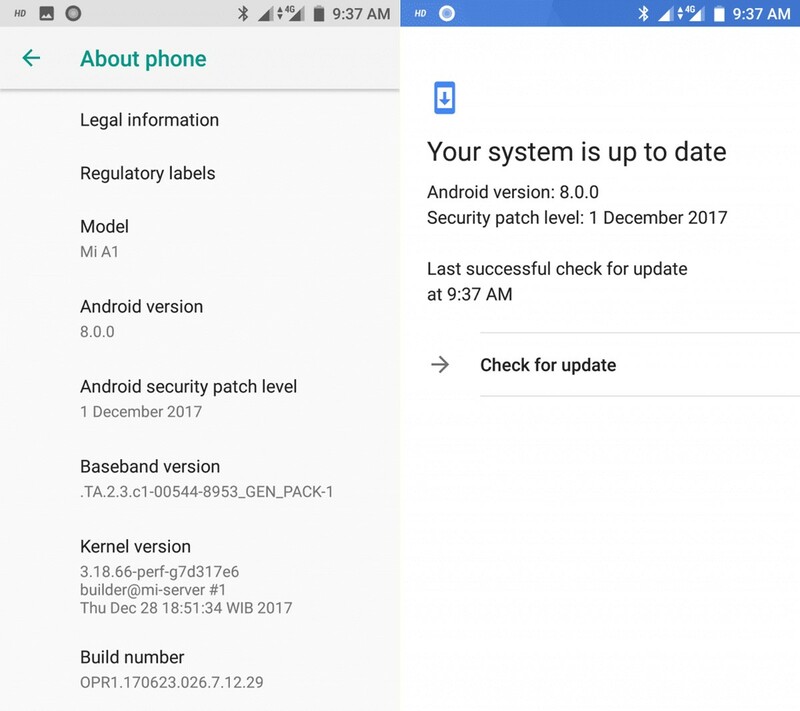 Update [December 31, 2017]: Xiaomi has released the Android 8.0 Oreo update for its Mi A1 users today. Coming in as 1.1GB, the update is available as an OTA for all users. Whether you were part of the beta program or not, the stable version is now available. Being an Android One device, the Mi A1 from Xiaomi was supposed to receive Android 8.0 update quicker, and it has. Not in a complete sense, though — as there are tons of other Android devices that have received the Oreo already, including one other Android One device in Moto X4, but yes, it is Xiaomi first device to see a day on Oreo. With Snapdragon 820 processor under the hood, the Mi 5 is a capable phone that can run Oreo easily. And indeed the company started testing the OS on the Mi 5 a while back. If you are interested, the company also recently started recruiting Alpha Beta testers for the Chinese ROM. You can check out more details here. The Mi 5 was launched with Marshmallow and has already been updated to Nougat. Like any other Android flagship phone, Oreo will be the second and last major OS upgrade for Mi 5 users. With testing currently ongoing, we are hopeful that an April release date is on the cards. Given that the standard Mi 5 will be receiving Android 8.0 Oreo, the same update should also hit the Mi 5 Prime and Mi 5 Pro at about the same time because the only difference these two have over the standard Mi 5 is the storage capacity. If you own the more powerful and slightly newer Mi 5s or Mi 5s Plus, Oreo is also coming your way, the only catch is that the date is still unknown. The Mi 5X has the hardware that makes it capable of handling Android Oreo. 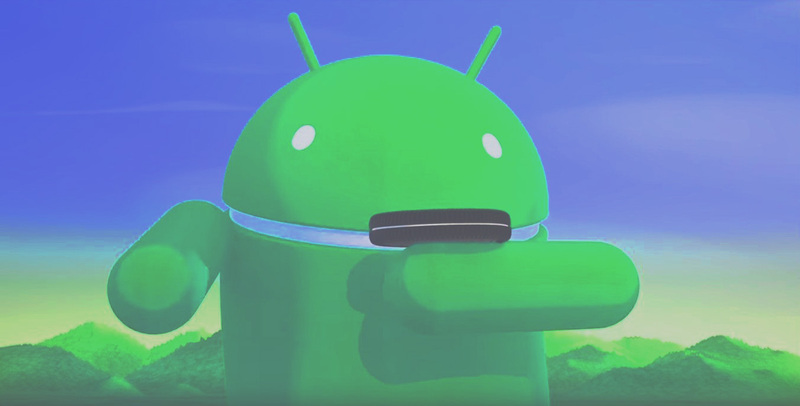 And, as it runs Android 7.1.1 out of the box, even if Xiaomi releases only one Android OS version update for the device, that would have to be Android 8.0. Oh, just so you know, the Mi 5X and Mi A1 are one and the same and since Xiaomi is the one handling the Mi A1’s updates and it has already rolled out Oreo to the phone, there’s no doubt Xiaomi Mi 5X will also get Oreo. Even better, we are hopeful that the 5X will get Android P too since the Mi A1 will also get it. Launched with Android 7.1 on board in March 2017, the Android 8.0 update looks very likely for the Mi 5C. After all, the 8.0 upgrade is only one level up from Android 7.1 and will be naturally the first big update for the Mi 5C. Expect the Mi 5C Oreo update to release sometime in Q3 2018. We have the Mi5 and its several variants above that will see Oreo OTA, but there is clearly no chance that Xiaomi would even consider once of preparing an 8.0 update for Mi 4 users, whichever variant you talk about. So, all of these devices would not get Oreo update: Mi 4, Mi 4i, Mi 4s and Mi 4c. And even Xiaomi Mi 3. Xiaomi used to power-pack the Mi Note devices with one of the best processor from Qualcomm’s Snapdragon 800 series, but for the Mi Note 3, they went with the bets in 600 series right now, the SD660 chipset. With 6GB of RAM, SD660 processor at heart, and running Android 7.1 since day one, the Mi Note 3 is one of the best phablet devices in Xiaomi Android 8.0 update list that can be sought if you want Xiaomi’s hardware with a promise of Oreo update. It’s a device that’s powered by awesome Snapdragon 821 chipset, the one that powered Google Pixel and OnePlus 3T sets too. These two received Android Oreo before the end of the 2017 and even though pretty much late, Xiaomi Mi Note 2 has finally been upgraded to Android 8.0 Oreo as part of the new MIUI9 8.3.15 update. The Mi Note 2 was launched with Marshmallow and later received a Nougat update. Now that Oreo is out, it’s possible that this is the end of the road for the handset. In short, don’t expect Android P.
Compared to a couple or so years ago, Xiaomi has improved significantly on matters of software updates. While it would have been too ambitious to expect a major OS upgrade on a midrange Xiaomi device a while back, today, we can assure that the Redmi Note 5 will get to Android Oreo. Even though we are being careful with the expected release date, don’t be surprised if the OS starts rolling out before the end of Q2 2018. The story shouldn’t be different for the superior Redmi Note 5 Pro. Update: Well, surprise! 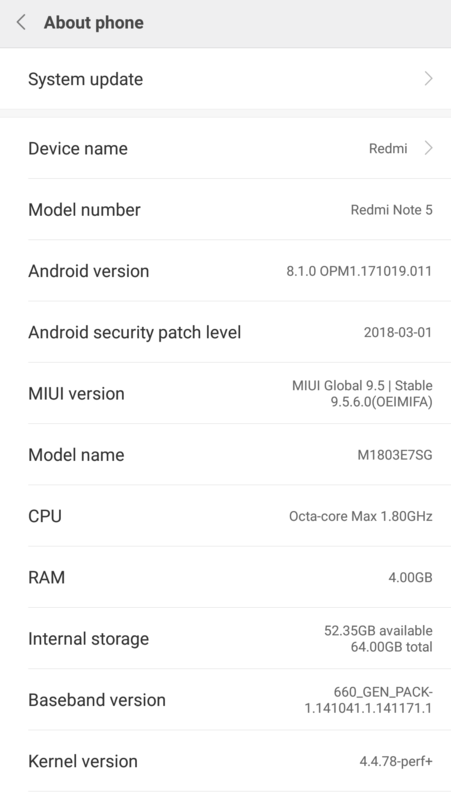 It appears that Android 8.1 Oreo is rolling out to the Redmi Note 5 in India as MIUI 9.5.6 and with it comes March 2018 security patches, which is rather odd from Xiaomi. Nonetheless, the fact that the update installs the latest stable OS overshadows the old security patch aspect, at least for now. Both of the Redmi Note 5A variants are expected to receive Android 8.0 Oreo update. The rollout of 8.0 update would take time, but we’re hopeful these devices would get an update from Android 7.0 to Android 8.0. Whether you own the Redmi Note 5A or the Redmi Note 5A Prime, you should see Xiaomi send you an update notification for the Android 8.0 sometime in Q4 2018. The most popular Xiaomi device to date, the Redmi Note 4 claims about 5 million users in India alone. but here’s some hard truth, this extremely popular handset that is easily spottable anywhere you go won’t be receiving an update to Oreo, given Xiaomi’s track record of software updates. Mind you, Xiaomi hasn’t confirmed the Oreo eligible devices yet, so there is a chance that they make an exception for their most user-favorite device, but as the device was launched with Android 6.0, and has been given the Nougat treatment as an upgrade, chances are more than not of Redmi Note 4 missing out on Android 8.0. Xiaomi would roll out MIUI 10 as an update for sure for the Redmi Note 4, but it would be based on 7.0 or 7.1.1, not 8.0, we think. The Redmi Note 4 was released in China with a MediaTek processor, but they released it with a Qualcomm Snapdragon 625 processor outside China, where they also released a Redmi Note 4X. Anyway, the above applies to all variants of the Redmi Note 4, so whether it’s 4X, or simply the 4, there is much lesser chance of Oreo update, as discussed in above paras in detail. Given the fact Xiaomi’s local competitor Huawei would release Oreo for its popular handsets from 2016, it looks very bad on Xiaomi part. Check out other devices in the Huawei Android 8.0 supported list here. The Redmi Note 3 is another popular device from Xiaomi that won’t get the Oreo update. Xiaomi could come up with MIUI 10 for the device, but that would be based on lower Android version than 8.0 for sure. The Redmi series without the Note in the name represents Xiaomi’s low-budget series, one that hasn’t receive much love from the company, kinda ever. There is no sugar-coating the fact that Redmi 4 owners should not expect the company to roll out Android 8.0 Oreo update. This applies to all Redmi 4 variants: Redmi 4, Redmi 4A, Redmi 4 Prime and Redmi 4X. Oh BTW, there is good chance Xiaomi would release the MIUI 10 update for the Redmi 4 sets, but which one gets it and which one misses it among the many variants is anyone’s guess. Short and quick: Xiaomi Redmi 3 and its variants are not under the plans for Android 8.0. Yep, that’s it. Will Redmi 3 get MIUI 10, right? Well, it looks likely because Xiaomi is kind of updating old devices with its new UI, which isn’t much exactly, although still great for any aging device. Xiaomi’s Mi Max 2 can easily be termed as the Android device with maximum battery life, thanks to it housing one of the largest battery in business, as well as Xiaomi’s battery-preserving MIUI software. As the device was launched with Nougat, we are hopeful of Xiaomi releasing the Oreo update for the Mi Max 2. There has been no confirmation till now from the company, so a very, very late release, probably in Q4 2018, looks to be on the cards. The Mi Max has seen a jump from 6.0 to 7.0, which fills up its quota of one major Android update policy that Xiaomi follows to heart, whether you like it or not. Xiaomi likes to keep its devices updated with new iterations of MIUI custom skin, which it takes care of for large no. of devices — even without improving on the Android version underneath the MIUI software, which is why you can find MIUI 9 — current version of the MIUI — to be based on 7.0 for one device, 7.1.1 for another, while even 6.0 or 5.0 on some old handsets. There is one strange thing about Mi pad specs if you carefully peruse their official pages over at mi.com. They do not have their Android OS version listed on the very pages where on totally expects them to be. This is actually our window into Xiaomi’s vision of software for their Mi Pad tablets, which says: we don’t care about software version on these tablets, and you shouldn’t either. Now, this is exactly why we don’t think Xiaomi would update the Mi pad 3 to Oreo. FYI, the Mi Pad 3 comes with Android Nougat installed, and thus totally deserves Oreo, but Xiaomi looks like giving any thoughts about Android OS updates for tablets. No chance, see the paras above to know why. Long story short, though: Xiaomi doesn’t care about software updates for tablets. Here’s a list of Xiaomi devices that are not plan of Oreo release by the company. Do let us know of your thoughts about Xiaomi software update strategy, which most consists of only one major Android OS update per device, whether that be their flagship device, or a mid-ranger.